The NCAA women's softball super-regionals are taking place this weekend, with teams trying to advance to next week's Women's College World Series. 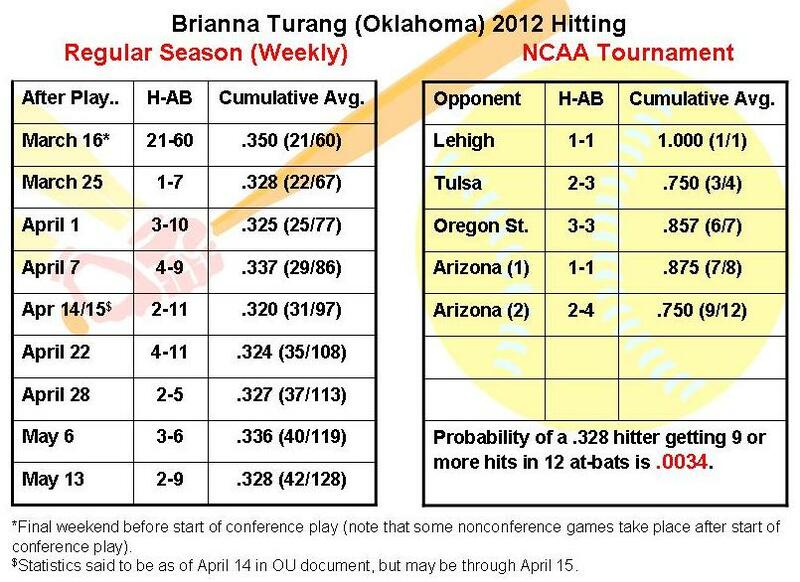 One of the hottest hitters in the postseason, if not the hottest, is Oklahoma junior outfielder Brianna Turang, whose team has already qualified for the World Series. As shown in the following chart, Turang has hit .750 (9-for-12) in five postseason games (three in the initial regional round and two against Arizona in the super-regionals).You may click on the graphic to enlarge it. The left-hand part of the display tracks Turang's batting average during the regular season. It first lists her batting statistics at the end of preconference play (i.e., as of the close of play on March 16) and then updates the statistics on a roughly weekly basis, coinciding largely with Big 12 conference play (even after conference play begins, however, there are still some nonconference games sprinkled through the schedule and these games are included in the stats). 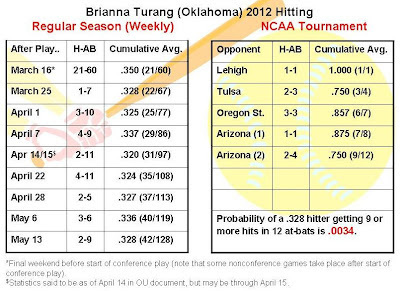 The data come from OU's softball news releases throughout the season. As can be seen, Turang's batting average varied within a fairly narrow range -- either a little bit above or below .330 -- over the final two months of the regular season, ending up at .328. The right-hand portion of the display shows her game-by-game postseason statistics, documenting her cumulative 9-for-12 performance. The relevant statistical question is the following: What is the probability of someone with a .328 regular-season batting average (i.e., long-term success rate) getting a hit in 9 or more of her 12 postseason at-bats? The answer, according to this online binomial-probability calculator, is .0034 or roughly 3-in-1,000.